Recently, I came across a photograph of a man with his head and two arms poking out of murky water. In each hand, he grasped an 18-inch-long fossilized sloth claw. I was instantly inspired and knew I had to meet this man and learn about the locality of these amazing fossil specimens! With a little research, I found that the man in the photograph was Mark Renz of Fossil Expeditions, about an hour south of Tampa, Florida. While his fossil expedition may not guarantee fossilized claws from a 15-foot sloth, he does offer the chance to find fossilized shark teeth, as well as many other types of fossils. Plus, I thought I might just find another pair of sloth claws like I saw in that photograph. Upon meeting Mark, I was very impressed. He and his wife, Marissa, have been taking people on fossil expeditions for over 20 years. Mark told me a bit about his past finds, which have included dozens of complete mammoths, sloths, saber-toothed tigers, and dugongs (a cousin of the manatee). Many of these fossils can be seen in local Florida museums today. He has also traveled the world in search of fantastic fossil specimens and has published numerous books detailing his adventures. Marissa is an artist and provides wonderful artwork for Mark’s books. This couple is quite knowledgeable and well equipped to take groups of anywhere from three to 100 out on a fossil expedition. 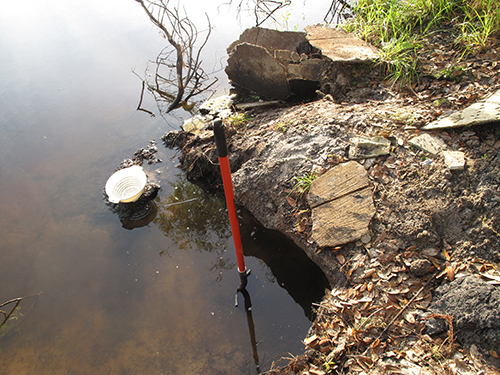 Florida’s geologic past is relatively easy to understand. The Florida plateau was formed around 250 million years ago when the supercontinent of Pangea began to break apart. This slightly raised plateau that we know as Florida is the result of marine sedimentation over millions of years. Throughout history, Florida has widened and narrowed as sea levels ebbed and flowed. As ancient sharks and other marine and land animals died, they would occasionally be covered by sediment, which would deprive their remains of oxygen. The lack of oxygen preserved the bones, and the surrounding minerals replaced the organic material of the bones and teeth. The chemical composition of the sediment relates directly to the colors of your fossil finds. Most of these fossils are black because they have a high calcium, iron, magnesium content. Imagine, some millions of years ago, when sea levels were much higher than they are now. Many parts of Florida were underwater. This means that sharks, as well as other marine species, made it to what is now inland Florida. 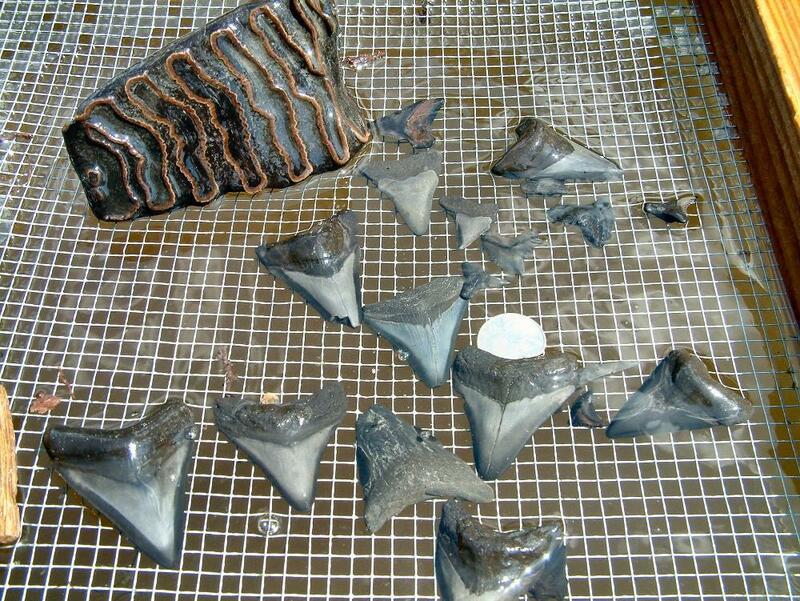 That is why it is possible to find fossil shark teeth in a riverbed an hour inland from the Gulf of Mexico. As a river flows, it cuts through layers of sediment. These layers represent different periods of time. Generally speaking, the deeper we go, the farther back in time we go. Going down only 10 feet in Florida is going back millions of years. At 10 a.m., during the first week in April, I met up with Mark and two families from Iowa for a spring break fossil shark tooth expedition. There were two couples and three children. We had a debriefing that explained what to expect and were given the option of doing an easy, medium or adventurous fossil dig. 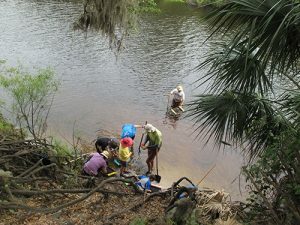 With an easy fossil dig, we would stay right at the riverbank and dig without getting very wet. On the adventuresome dig, we would cross a chest-deep river and screen for teeth in deeper water. 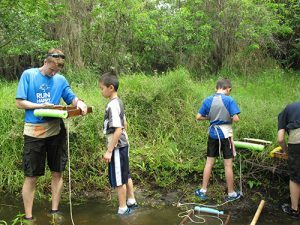 Being an adventurous bunch, we chose to cross the slow-moving river and dig in deeper water. The two fathers carried their children across. sediment from the river’s bottom. 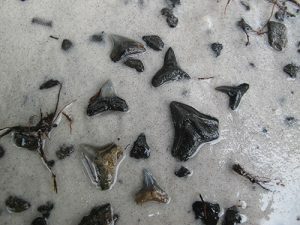 As the water washed away the silt and smaller debris fell through the screen, I noticed a shiny, black shark tooth! This was a good sign, as this was only my first shovelful of sediment. The day continued, and I added shovelful after shovelful into the screen, and on average I found two shark teeth per scoop. In some scoops, I found only one tooth, while others yielded up to 10 teeth! After a day of this, I felt good about what I had found. Throughout the day, Mark and I and the two families from Iowa got to know each other, and it was good to see the adults just as excited as the kids. As we found fossil specimens, Mark would identify them. My Day-One find consisted of 30 to 45 shark teeth, mixed with some other various fossils. 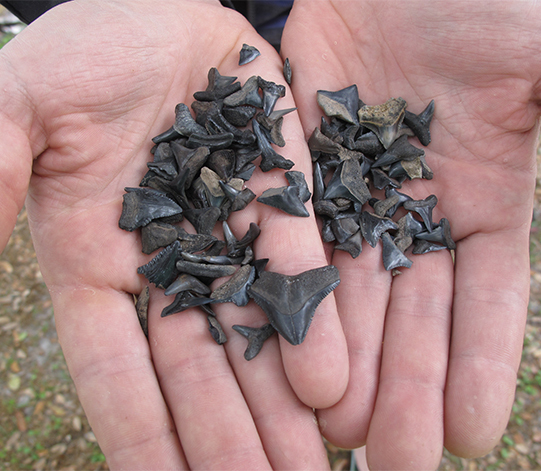 The shark teeth came from species such as the mako, lemon, snaggletooth, tiger, and sand tiger. Stingray “teeth” were a common find. These are really grinding plates the animal used to crush shells and such things. We also found many fossilized stingray spines, in addition to fossilized land tortoise shell fragments, barracuda teeth, and horse teeth. For the second day of my Florida shark-tooth expedition, I drove to Venice Beach early in the morning, before the sun had risen. 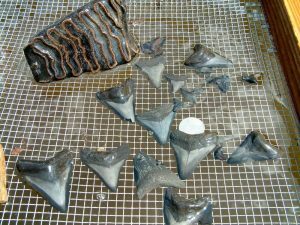 I was to go on a SCUBA-diving trip to collect the massive (6 inches or longer) Megalodon teeth offshore in the Gulf of Mexico. As I got closer to Venice Beach, my excitement grew; however, a storm was also growing. When I arrived at the dive shop, I was informed that the dive would be cancelled due to bad weather. We cannot control the weather, so I accepted it and decided to spend the day on the beach. All over, there were people holding specially made shark-tooth screens. They stood at the water’s edge and screened their scoops of sand. Instead of collecting shark teeth, I decided to spend my day collecting seashells and washed-up coral. While Venice Beach is known as the “shark teeth capital of the world”, it is also known as a great place to collect beautiful seashells. During my third day in Florida, I met back up with Mark and others for another fossil expedition. We had another great day of collecting. Despite it being early April, the weather was very nice. Spending all day in the river was not an issue, especially considering everything we found. My find for Day 3 was 150 to 200 smaller shark teeth, some of them up to an inch long. At the end of the day, Mark and I were back at the truck conversing when some locals came up and showed us some amazing fossils they had found nearby. Among them were 4-inch-long horse teeth, pieces of mammoth tusk, and 2-inch-long shark teeth. 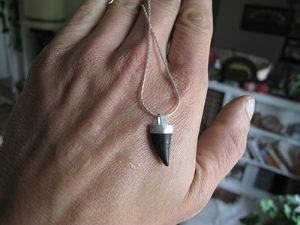 My plans for the shark teeth I have found are to make jewelry and sell them individually. It is easy and a lot of fun to make wire-wrapped necklaces with the bigger shark teeth. The teeth can also be made into earrings. I also made displays of my finds in shadow box picture frames. expedition. March through April is a perfect time to come; the water is low enough to negotiate the river comfortably. While you may think summer is the perfect time to go, one must realize that in Florida it rains a lot in summer. The river levels rise significantly, making it hard to do anything in the rivers. There is no need to worry, though; there are alternative options for finding fossils, as one may search the banks or streams instead of rivers. While we are allowed to keep any fossils we find, we are asked by our fossil guide to turn over any significant finds to the local museums. This way, they may be accessed easily by scientists for studying. 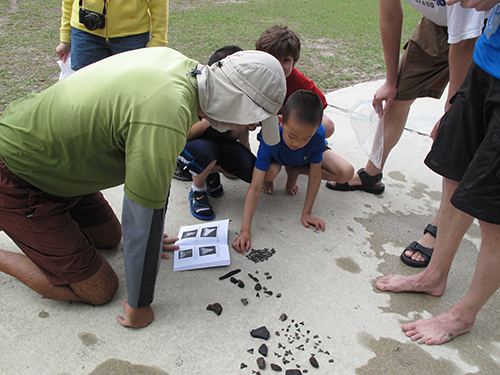 In the past, Fossil Expedition participants have made significant fossil finds. This opens up another important topic of discussion, and that is the importance of considering what we do with the fossils that we find. Do we keep them for ourselves, adorning our homes with them? Do we contact museums and universities and ask them to keep them for scientific study? While there is nothing wrong with keeping special fossil finds for ourselves, it is worth considering the importance of allowing universities and museums to have them instead. When scientists study fossils, it is easier for them to access a whole collection in one location than to travel to see personal collections in homes across the country. I was especially pleased to hear Mark touch on the topic of conscientious collecting. We all get tempted to search for treasures in restricted areas, but it is not an appropriate option. If only there was a way to obtain permission to find the treasure in such a way that both parties win. Mark has demonstrated that this is quite possible. 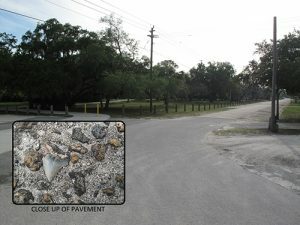 Once, he stumbled upon some mastodon fossils on Florida Department of Transportation (DOT) property. Instead of illegally surface collecting what he could and getting out of there, he contacted the DOT and found a way to excavate with heavy machinery, while making everyone happy. As a result, dozens of complete fossil skeletons of many large mammals, such as sloths, mastodons, old-world horses, wolves and deer, were recovered. I bring this up because most of Florida is private property and there is a, abundance of fossils everywhere you turn. It is important to maintain the right to collect, so we must work together and respect private property. If you live in Florida or have a lot of time to spend there, you may consider collecting on your own. A good way to start would be to join a local fossil-collecting club. Joining a club will put you in contact with long-time collectors who can help get you started, and you can go out on field trips with others. Whatever you do, make sure you obtain a fossil-collecting permit from the Program of Vertebrate Paleontology in Florida (www.floridamuseum.ufl.edu/index.php/vert?paleo/amateur-collector/fossil-permit/). If you choose to go on a Fossil Expedition, you do not need to worry about a fossil permit, because Mark has already obtained them. Maybe you have interest in only seeing Florida’s fossil wealth, while not doing the hard work of digging for them. Visiting a local museum is the best way to see what Florida has to offer. Some museums worth checking out are the Florida Museum of Natural History in Gainesville and the Clewiston Museum in Hendry County. 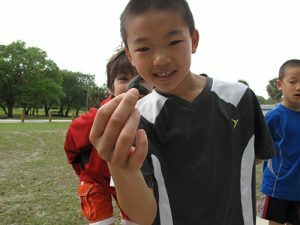 Florida Fossil Expeditions provided me with a great spring break trip. I was able to soak up the sun and find amazing fossils. When I returned home, I was able to make jewelry with what I had found. I recommend this trip for anyone interested in fossils, sharks, or just a good time. Contact Mark at (239) 368-3252 or visit www.fossilexpeditions.com. The State of Florida recognizes the importance for collectors to collect and so thanks are in place for them.